The very first gel pillows mask available! The Respironics Nuance and Nuance Pro Gel Pillows Mask is the next chapter in sleep therapy delivering a new approach of comfort and design to CPAP therapy. The one and only CPAP Pillow Mask available to CPAP users with gel pillows and a choice of a gel frame of fabric frame. Respironics has begun a new revolution with the Nuance and Nuance Pro Gel Pillows Mask. The Gel Pillow Cushion on the Respironics Nuance Nasal Pillow CPAP Mask will allow the pillow mask user to experience comfort in a whole new way during CPAP therapy. Feel the comfort and get the seal in one CPAP mask. The secret to the comfort is found within the gel which contours to the nose better than standard nasal pillow CPAP masks on the market. By contouring to the nose there are fewer leaks and fewer restless nights. With the Respironics Nuance and Nuance Pro gel pillows mask lessens the discomfort and irritation CPAP users have found in the leading pillows masks. 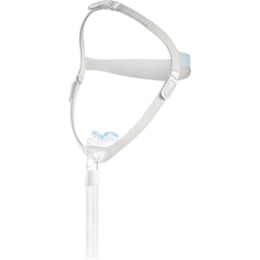 The design of the Respironics Nuance and Nuance Pro gel Pillow mask is not just simple but simply the best option for comfort; CPAP therapy and compliance to the CPAP pillows mask users. Rated over the leading CPAP pillows mask on the market in test trials, the Respironics Nuance and Nuance Pro Gel Pillows CPAP Mask will quickly become the CPAP mask of choice for comfort. Not only is the Nuance and Nuance Pro Nasal Pillows CPAP cushion making waves but the headgear will too. 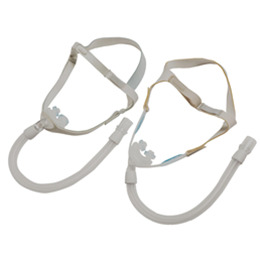 Respironics didn’t stop with the first and only gel nasal pillows offered on the Nuance and Nuance Pro Nasal Pillows CPAP Mask but offers either a fabric frame or gel frame. CPAP users preferring of the gel frame will love the contouring nature as well as the soft feel against the face. CPAP users preferring the fabric frame will enjoy the lightweight and soft feel delivered during CPAP therapy. Either choice is a great choice because both frames have the comfort and compliance necessary to complete the end result, comfortable, compliant, and peaceful CPAP therapy. 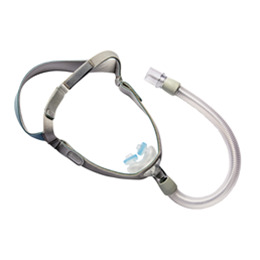 The lightweight, comfort driven Respironics Nuance Nasal CPAP Pillow Mask and Headgear defines comfort and conveys the CPAP user’s wants and needs into a simply designed mask. Although the Nuance and Nuance Pro Gel Nasal Pillows CPAP Mask is simplistic in design the finished product is the result of research, comparison, compliance necessities, patient feedback, and combinations of Respironics commitment to CPAP therapy innovations and development.